NEW YORK, NY--(Marketwired - Mar 25, 2014) - Some fees aren't fair -- especially if they're hidden. FeeX is launching today to tip the scales back, and help people understand and take action against excessive and often hidden fees that can eat a THIRD or more of their retirement savings. Built on a network of actionable, crowd-powered financial intelligence, FeeX is the first community-based solution to a problem affecting tens of millions of Americans. 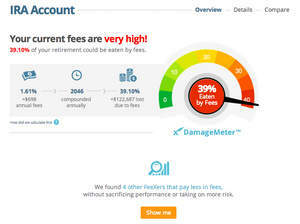 A free sign-up at FeeX.com shows people, in dollars, how much they're paying for their investments and estimates the damage fees will inflict by the time they retire. With help from others in the community, FeeX shows people how to reduce those fees before it's too late. "If you don't know how much you're paying in fees, you're probably paying too much," said Yoav Zurel, CEO of FeeX. Reports from the 2013 Investment Company Factbook point to $5.4 trillion retirement dollars invested in IRAs, accounting for 27 percent, the lion's share of U.S. national retirement savings. Consequently, Americans paid $43 billion in fees in their IRA accounts last year alone. The initial launch of FeeX will expose these IRA-related fees for the 40 percent of American households that hold them. Typically, investing fees are not front and center on retirement account statements. As a result, many Americans are unaware of the true costs of their investments. FeeX is breaking this asymmetry by shining a light on both the short and the long-term effects of fees. To reduce these fees, FeeX offers users crowdsourced cues based on the anonymous, empirical efficiency of other users' portfolios. This crowdsourcing element allows FeeX to remain objective while helping users rescue their retirements -- without sacrificing performance or taking on more risk. "Again and again we're seeing that the power of community trumps other more traditional, individual approaches," said Uri Levine, FeeX co-founder. "Why hold only one piece when together, we can see the whole puzzle?" FeeX is co-founded by Mr. Uri Levine, who also co-founded crowdsourced traffic app Waze, acquired by Google in 2013. This time, Uri wants users to trust the wisdom of the crowd to help people save each other money. Based on FeeX's test market in Israel, results from trials have already identified potential fee savings of $52 million for its 25,000 early adopters. In the future, FeeX plans to expand its service to include other types of retirement and financial accounts. To provide users with easy and secure access to their financial accounts, FeeX is partnered with Yodlee, the financial platform powering 9 out of the top 15 U.S. banks. "Yodlee Interactive is committed to powering innovation in the global financial marketplace, so we are excited to be working with FeeX to help prepare their community for retirements," said Joe Polvevari, General Manager for Yodlee Interactive. FeeX is always free and always objective. Sign-up today at FeeX.com and fix your fees. FeeX is a reaction to hidden and excessive fees that can drain a third or more of Americans' retirement savings. A Robin Hood for the digital age, FeeX is a community of people on a mission to rescue their life savings from the tyranny of unfair fees. The more people that sign up, the better FeeX can help everyone. Join the movement today!